Hastings Sand Coulee Scientific and Natural Area (SNA) was first designated in 2007 and greatly expanded in 2011. The Minnesota Biological Survey identified this site as “one of the most biologically important sites in Dakota County.” An unnamed intermittent stream, a tributary of the Vermillion River, runs through all three of the disconnected units of this SNA. 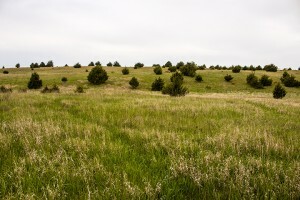 The South Unit is a 79-acre dry prairie with scattered eastern redcedar. 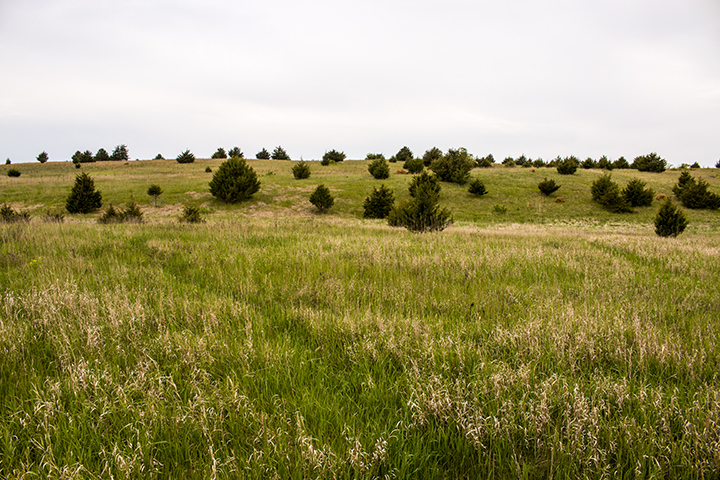 The North Unit is 178 acres and includes a more diverse mix of dry prairie, oak woodland, and former cropland being restored to prairie. The tiny, 6¾-acre Center Unit is an abandoned gravel pit. Seven state listed species have been seen on at least one of the units, including Lark Sparrow, regal fritillary, and kittentails. Ottoe Skipper, a threatened species, has also been reported here but has not been added to the county distribution map for the state. The Friends of the Mississippi River has done considerable work restoring the site. This is especially apparent in the North Unit. Following decades of fire suppression, what had once been a hill prairie has become bur oak woodland with a dense shrub understory. Most of the shrub layer in this section was removed in December, 2013. A large area of former cropland has been reseeded with prairie grasses and forbs. In the South Unit much of the common buckthorn has been removed from the area along MN Highway 361. Visitors this week (late May) to the South Unit will find more fringed puccoon in bloom than they may have seen anywhere else. Hairy puccoon and hoary puccoon are also blooming here. Other flowers blooming now include birdfoot violet, prairie violet, prairie blue-eyed grass, ground plum, cypress spurge, balsam groundsel, narrow-leaved hawkweed, and narrow-leaved hawk’s-beard. If you walk slowly and look close you will also find in bloom corn speedwell, hairy purslane speedwell, and long-leaved bluet. Resident birds are curious about the occasional visitor. If you bring your binoculars you will probably spot a western meadowlark and a lark sparrow. You will certainly hear field, clay-colored, and grasshopper sparrows. In the North Unit kitten-tails, violet wood sorrel, winter cress, downy phlox, and smooth yellow violet are all in bloom this week. 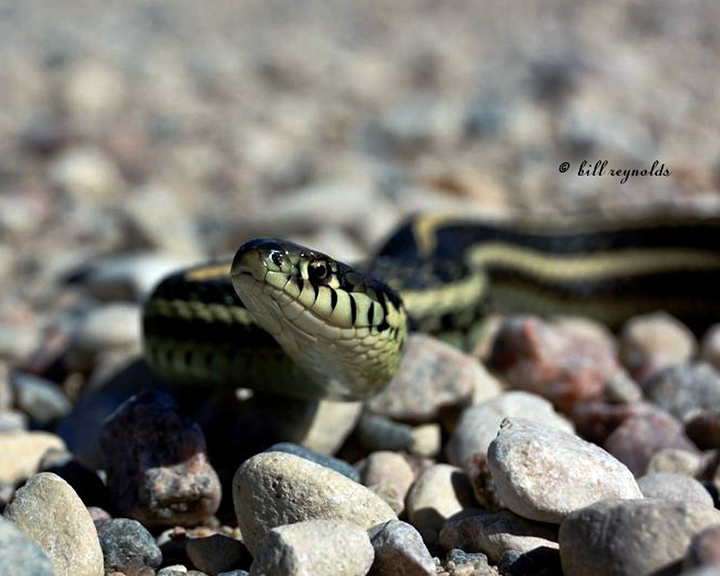 This entry was posted in Nature Destinations and tagged Hastings Sand Coulee SNA on May 30, 2015 by John Valo. Showy orchis (Galearis spectabilis) is occasional in moist, rich, deciduous woods in the Eastern Broadleaf Province ecological region. In Minnesota, that includes the southeast and metro areas and continues northwest to Becker County. 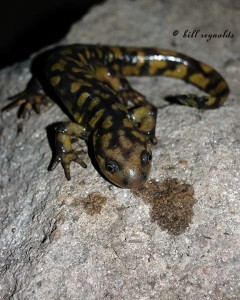 The plant is becoming less common as its preferred habitat disappears. 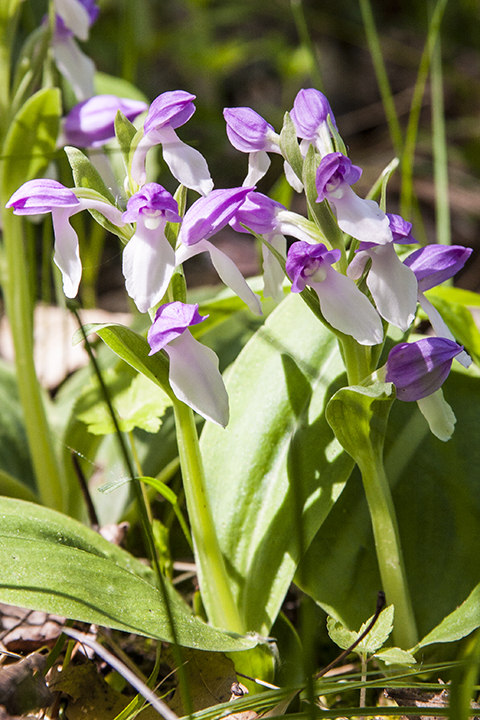 Though showy orchis is the first orchid to flower in the spring in Minnesota, the plant is often overlooked. In its first year the plant produces a single aboveground leaf and a new underground tuber and roots. The leaves die back in October or November. In subsequent years two leaves are produced. After four to six years it finally produces a single flowering stem. There are two species of Galearis in North America, and both are found in Minnesota. Showy orchis is distinguished by the leaves, the lower petal (lip) of the flower, and the habitat where it is found. There are two basal leaves on a flowering plant. The lip is more than ⅜″ long, is white with no spots, and is not lobed. It occurs only in moist, rich, deciduous woods. This entry was posted in Plants and tagged Galearis spectabilis, showy orchis on May 16, 2015 by John Valo. This entry was posted in Amphibians and tagged Ambystoma tigrinum, eastern tiger salamander on May 7, 2015 by John Valo. There are about 340 species of delphinium if you include, as some authors do, 40 Old World species in the genus Consolida. Of the 300 species in the genus Delphinium, all contain high levels of the alkaloid delphinine, and are toxic to livestock. All have deeply palmately lobed leaves, petals smaller than the sepals, and a spurred upper sepal. Prairie larkspur (Delphinium carolinianum) blooms from May to June on dry prairies and open woodlands. It is distinguished by the moderately to densely hairy stem; erect flower stalks that appear appressed to the inflorescence axis; four petals; three to five pistils; and densely ridged seedcoat. 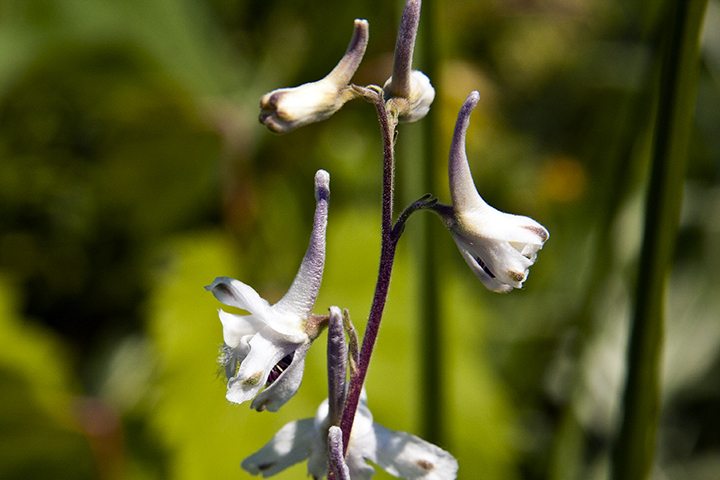 There are four subspecies of prairie larkspur. Only one, Delphinium carolinianum ssp. virescens, is found in Minnesota. This subspecies is identified by its height usually more than 18″; a branched horizontal root system; basal leaves still present at flowering time; leaf blade with 5 to 7 primary segments; uppermost leaf stalk more than 3 ⁄16″ long; and white to very pale blue sepals. This entry was posted in Plants and tagged Delphinium carolinianum ssp. virescens, prairie larkspur on May 5, 2015 by John Valo.